AngularJS provides an application exception handling ($exceptionHandler ) service that traps unhandled errors. The default implementation of this service simply delegates the exception to the $log service which just displays the error on the browser console. As we can imagine, the user does not view these errors, and since the data is not collected, there may be some valuable information that goes unnoticed. In order to help us improve the quality of our app, we need to add client side instrumentation that can enable us to track exceptions and send them to a centralized location for inspection. Since AngularJS already sends uncaught exception to the $exceptionHandler service, we can override this service and provide an implementation that can help us capture and report these errors to a server service. In order to send the client errors, we first need to create a service that can be used for server side logging. This service just needs to accept an object with the exception information and call the corresponding API. This is the service that is injected into our implementation of $exceptionHandler, so we are able to handle and send the error. Notice in the code below how we are using JQuery Ajax and not the $http service. The reason behind this is problem with circular reference. We cover this concern in a later section. We can override this service by declaring a factory with the same name. In this factory, we can inject the $svcLog service that we created. This way this works is that AngularJS delegates all the unhandled error calls by calling the service handler function. In this function, we get the exception object. For our simple logging service, we are just passing the message and stack information from the exception object. We also want to continue to log the error to the console window and allow the application to continue its execution. To enable that, we need to call $log.error.apply($log, arguments). We are now ready to simulate an error on our application. In our home controller, we are going to make references to an undefined object. This should cause an error on our application. AngularJS should trap this unhandled error and delegate it to our implementation of $excetionHandler which sends the error to our server. The createError function is called by a button on our view. We are also handling an app-error broadcast message which can enable us to display the information on the controller. To get around this problem, we just need to inject the $injector service into our $exceptionHandler service and then inject our $svcLog using code. This is a way to force an injection without the circular reference. To show this, we create the $svcLogHttp service which uses the $http service to make the AJAX call. As we can see on this demo, we are not only maintaining the same behavior by logging into the console and allowing the application to run, but we are also able to send (simulate as there is no server accepting those requests - 404 error on console) the messages to our server which enable us to discover some interesting stuff that may be happening with our application. When making a CORS request, we need to understand that for every request that we send to a different domain, there may be two requests made to the server, preflight and actual requests. For each of these requests, the server must respond with the Access-Control-Allow-Origin header set with the name of the origin domain. A preflight or OPTIONS (HTTP verb) request is created by the browser before the actual request (PUT,POST) is sent for a resource in another domain. The goal is to have the browser and server validate that the other domain has access to that particular resource. This is done by setting the Access-Control-Allow-Origin header with the host or origin domain. Once the preflight request has a response with the corresponding headers, the browser sends the actual request. For this request, the server also checks the CORS policies and adds the Access-Control-Allow-Origin header with the host domain. 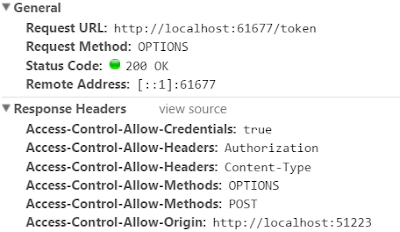 The way to implement CORS using OWIN and MVC Web API is by first configuring the oAuth server options with an implementation of OAuthAtuhorizationServerProvider on the Startup class. The code above overrides the MatchEndpoint handler. This area of the code is called for every request including the preflight request (OPTIONS). Note that this handler is called before a call is made to Validate Client Authentication. This is where we need to manage the logic of adding the headers using OWIN. We do this by calling the SetCORSPolicy method. The SetCORSPolicy method looks for a configuration setting (allowedOrigins) that contains the whitelist of domains that can consume the resources from our API. It then reads the Origin header to get the domain name (including scheme and port i.e. http://mydomain.com:80). If the origin domain is found in the configuration, the Access-Control-Allow-Origin response header is set to the origin domain value. This is what helps us resolve the “No 'Access-Control-Allow-Origin' header is present on the requested resource”. Do not use app.UseCors(Microsoft.Owin.Cors.CorsOptions.AllowAll) as this allows all origin domains to have access. We could use this option for public APIs with no restrictions. We need to keep in mind that once we start using OWIN, we are essentially passing the CORS concern to the middleware. We do not want to start making changes in different areas of the application as that just makes thing confusing. We just need to focus on the AuthorizationServerProvider and add the necessary implementation to enable CORS in our apps. Thanks to all for attending the presentation.